On December 9, 2014 Sophal and his wife Thea, parents of three children, have been released from prison. They are very happy about their discharge and being able to see their children again after such a long time. Even though they were both innocent of any crimes, Sophal and Thea were forced to spend three and a half years of their lives in prison. From left to right: Mr. Ouk Vandeth (IBJ country director), Sophal and his wife Thea. This nightmare began back in June 2011, when the police force discovered a body in Koh Kong province. From their investigation it appeared that the man was murdered three months earlier. Police officers started interrogating people and asked Sophal and Thea to visit the police post as well. The couple was uninformed regarding the contents of the interview and they were interrogated separately. Sophal and Thea had a solid and convincing alibi, as they were visiting family in Kandal province, located approximately 350 kilometers away from Koh Kong. Nevertheless, the police reported having eyewitnesses who claimed having seen the suspects at the crime scene on the day of the murder. Thea and Sophal denied this severe accusation and refused to sign the police record stating their confession of guilt. As a result, police officers started threatening with a prison sentence of eighteen years if they would not cooperate. 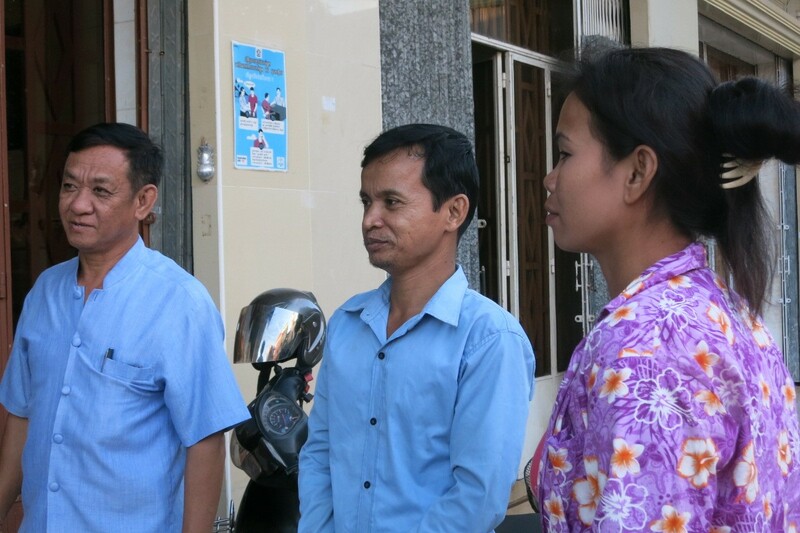 After three long days of threats and intimidation in police custody – which is in fact illegal as “the maximum duration of any police custody is 48 hours” according to the Cambodian Code of Criminal Procedure – Thea and Sophal finally signed the police record with their wrongful confession. Furthermore, police officers never informed them about their rights and did not even let Sophal make a phone call – claiming they had no battery on their phone. The unjust police record was sent to the prosecutor who interrogated Thea and Sophal. During this questioning, the couple denied the police record but did no mention of the police threats out of fear for potential reprisals. The trial hearings took place on February 6, 2012, which was also the day their court-appointed lawyer met Sophal and Thea for the first time. Two eyewitnesses testified seeing Thea and Sophal killing the man but changed their version of the story from the original statements to the police. The defense lawyer requested an acquittal explaining that Thea and Sophal were not in Koh Kong during the murder. Even the prosecutor raised the fact that the eyewitnesses had changed their testimony, but the trial judge nevertheless sentenced Sophal and Thea to seventeen years in prison. The unfairly penalized couple appealed on March 9, 2012. There is only one Court of Appeal in Cambodia and appeal cases are often pending for a very long time before being heard. Meanwhile, the accused unnecessarily languish in jail. Unfortunately, IBJ does not have an office located in Koh Kong province and can therefore not provide legal aid on a fulltime basis. Nevertheless, Mr. Ouk Vandeth (IBJ Country Director and Fellow) regularly visits the province to take cases of people suffering from the unjust court system in prison. 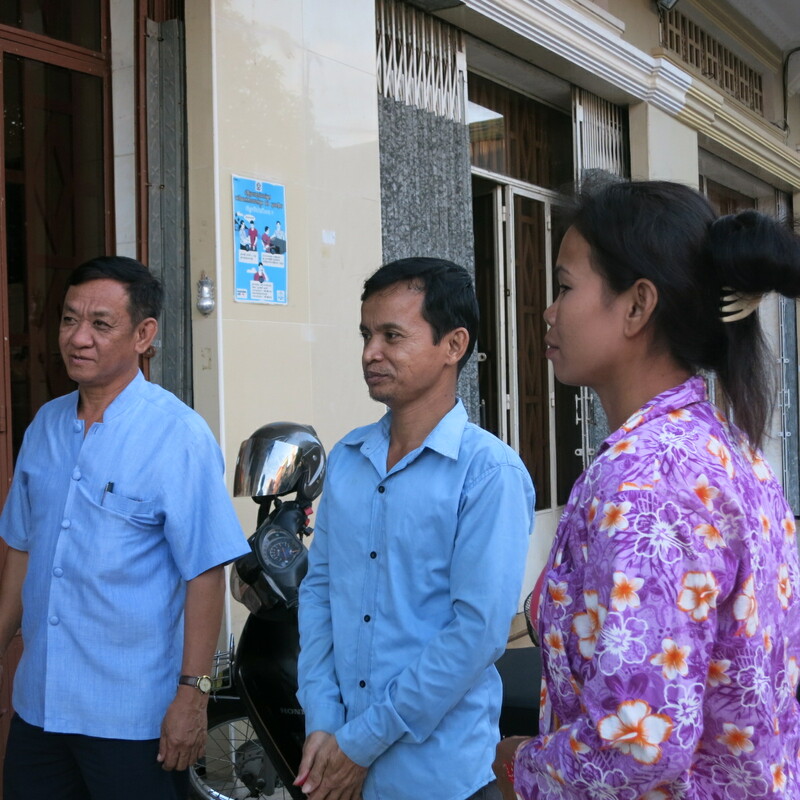 During one of his visits at Koh Kong prison to meet a client, Mr. Ouk Vandeth met Sophal, who had by that stage already spent two years imprisoned without any update regarding their appeal. Mr. Ouk Vandeth referred the case to the IBJ lawyer located at the Court of Appeal, Mr. Kin Vibol, who then examined it and pushed the court to set a trial date. The hearings had still been postponed several times, but the case was finally heard on November 19, 2014. Mr. Kin Vibol explained that his clients were not in Koh Kong at the time of the crime, that there was no physical evidence proving their guilt, and questioned the reliability of the witnesses as they had changed their testimony. This trial finally resulted in the release of Thea and Sophal on December 1, 2014. The General Prosecutor of the Appeal Court however, requested a cassation to the Supreme Court, meaning that Thea and Sophal are possibly not entirely done with the judicial system yet. The couple remains puzzled concerning the false accusations, as they have never had any encounter with the police force or legal system, and had no relations to the murdered victim whatsoever. The acquittal verdict came to Sophal and his wife as a great relief and surprise at the same time. They had no trust left in the Cambodian justice system and their lengthy trial procedure led them to believe that they were facing life in prison. Sophal and Thea are deeply grateful to IBJ for the positive turn of events in their life. Hopefully this court decision is the end of their nightmare, allowing them to peacefully resume their fulfilled family life. 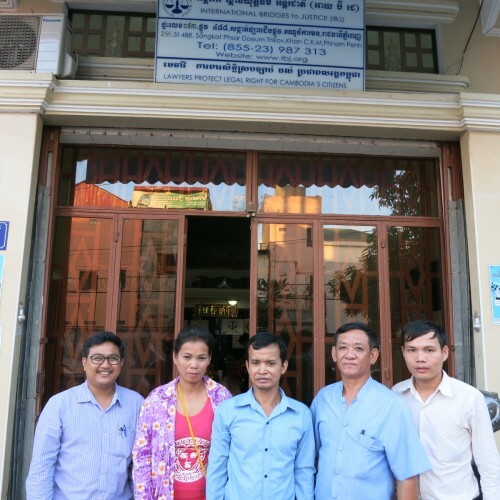 From left to right: Mr. Kin Vibol (IBJ lawyer) with his released clients Thea and Sophal, Mr. Ouk Vandeth (IBJ Country Director) and Mr. Sok Sopheak (IBJ lawyer assistant) in front of Phnom Penh IBJ office. Clients’ names changed for confidentiality.